My first thought was, "Good grief! When does Mr. Glebas find all this time to write--he'd just recently released the Animator's Eye ( another great book )." But to my amazement the book was every bit is powerful as his previous books, but it is vastly different. When Glebas says, "Incredibly Easy", he's not kidding. Don't misunderstand me, this isn't a step by step method book wherein you plug in ideas and spit out ready made stories. It is, however, a very simplified way of viewing and building your story in a way that allows you to literally "see" the logical ebb and flow of your story immediately. The biggest hurdle to up and coming story artists is that we often times get lost in the weeds when developing our stories and character arcs. This leads to a lot of useless drawings and time spent digging our way out of weak premises and lackluster stories. Glebas' method reminds me of a fine gesture drawing. Like a gesture it articulates the feeling, structure and story of the pose in a quick, clear way without the artifice of a bunch of extra squiggly lines. In fact, the "Visual" portion of the book that depicts the structure is conveyed literally like a gesture drawing. The structure of the book itself is built in two halves. The first is a story, much like a storybook, featuring Iggy and Scared Bunny as the protagonists. The story is quick but complete from exposition, insighting moment, fun & games, false victory, dark night of the soul moment and so on...( I say it matter-of-factly because Glebas made the turns in the story so simply it appeared effortless in the telling). The second portion of the book breaks down why it appears so simple. In this half there are a series of drawings that look like the spine of a dragon that we follow from tail to head. This gives us the ability to see the peaks and valleys of the story readily, as well as many other story-telling elements that you'll see when you purchase the book. What makes the book so valuable and important is that it speaks to visual story-tellers in a visual way. Most every other book on story-telling is written with the potential reader being a story-teller with words. It's so logical to approach artists this way, it makes you wonder why someone hadn't thought of it sooner. Thankfully, Glebas was the one to do it. He's a gifted story-teller and an equally gifted teacher. When you couple that with the inexpensive price of the book, you get the silver-bullet of story-telling instructionals. It's a must have for any aspiring story artist. A former Disney director and story artist shares the secrets of storytelling. This approach evolved out of over thirty years of research born out of the frustration of continually being lost when trying to create a story. Learn how to fulfill your audience's fantasies by weaving your stories together using this revolutionary VISUAL approach to story structure. 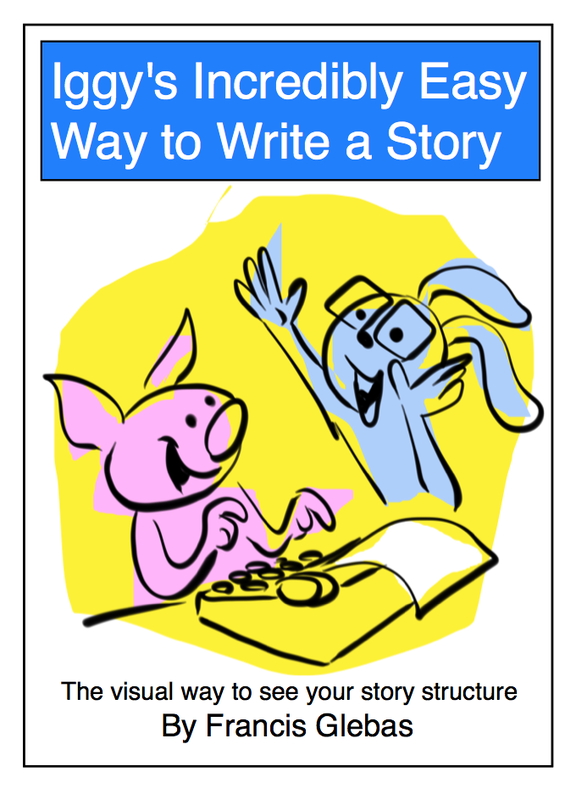 Iggy's Incredibly Easy Way to Write a Story includes a short illustrated story of Iggy, the impulsive pig, trying to make it big in Hollywood leaving his friend, Scared Bunny, behind. See what Iggy learns and then follow an illustrated step by step guide to help you write your own story the easy way. Never get lost again. You don't have to be a "writer" to create a story. Weave it! If you find my books helpful, I'd really appreciate if you could post a review on Amazon. Thanks.